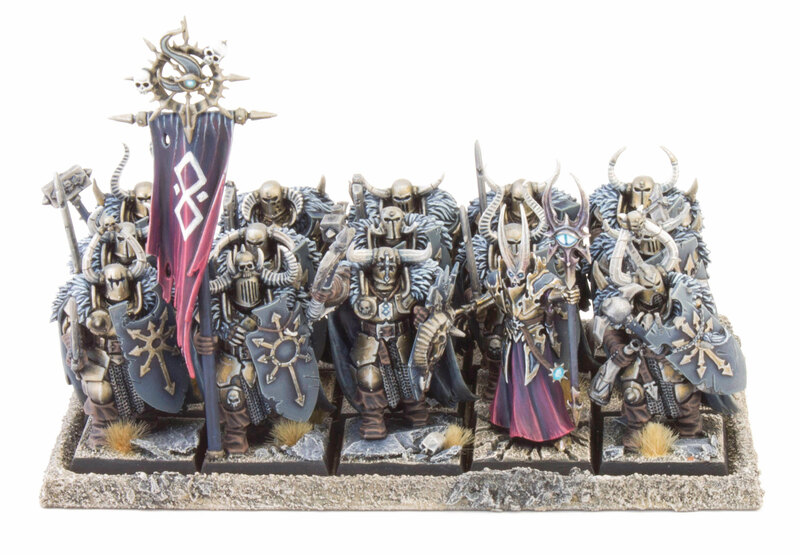 This entry was posted in Armies on Parade, Colin Price, Showcase and tagged #ageofsigmar, #warmongers, Age of Sigmar, Chaos, Colin Price, Technasma, Tzeentch, Warhammer, Warriors of Chaos. Bookmark the permalink. Great stuff. Verys inspirational. 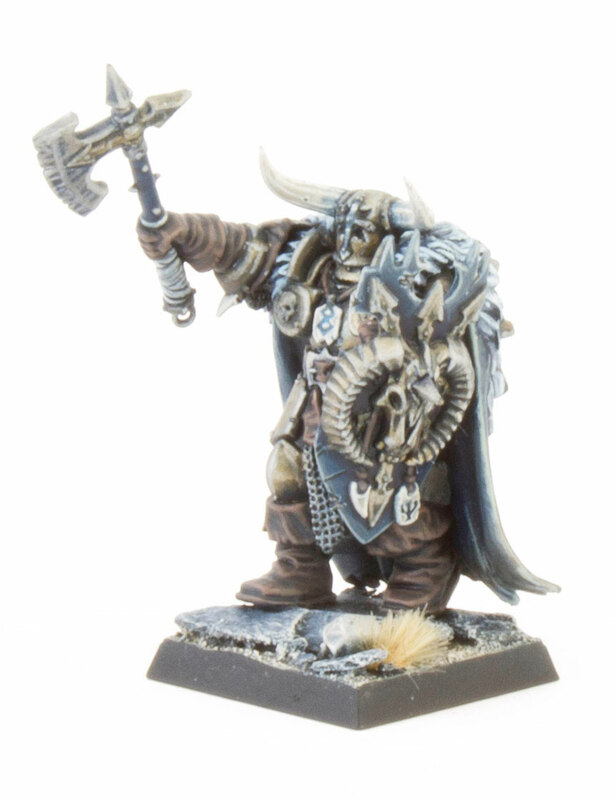 Helping alot with ideas for a Tzeentchian warband for a Path to Glory campaign for Age of Sigmar. 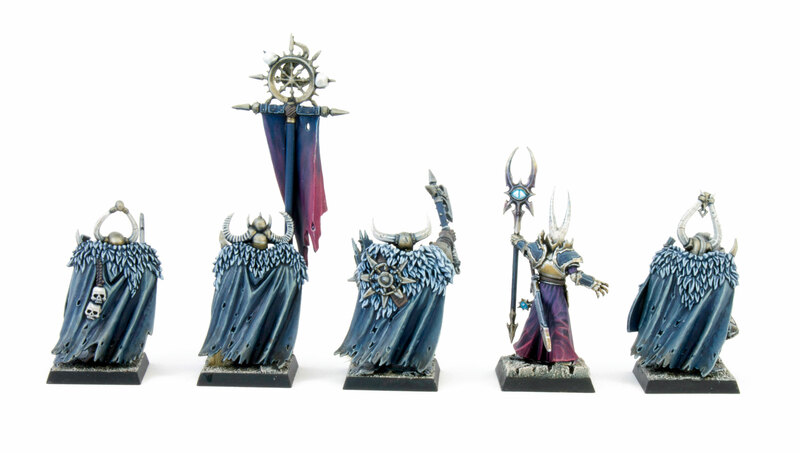 A step by step tutorial on how to paint these would be great, as I too have started a Path to Glory campaign with Tzeentch and these are beautifully painted and a true inspiration! Please help a fellow sorcerer out! I drybrush then glaze Vallejo Field Blue over Cantor Blue to build up the intensity. Edge highlights are done by mixing white and Vallejo Dead Flesh to Field Blue. Hope this helps! Hi Elmgreen! Thanks for stopping by, glad to hear you like my work. I’m happy to share my recipe. I’ve putr some guidance in the blog article and some of the comments above yours. The secret is starting with a Kantor Blue Basecoat for the whole model. 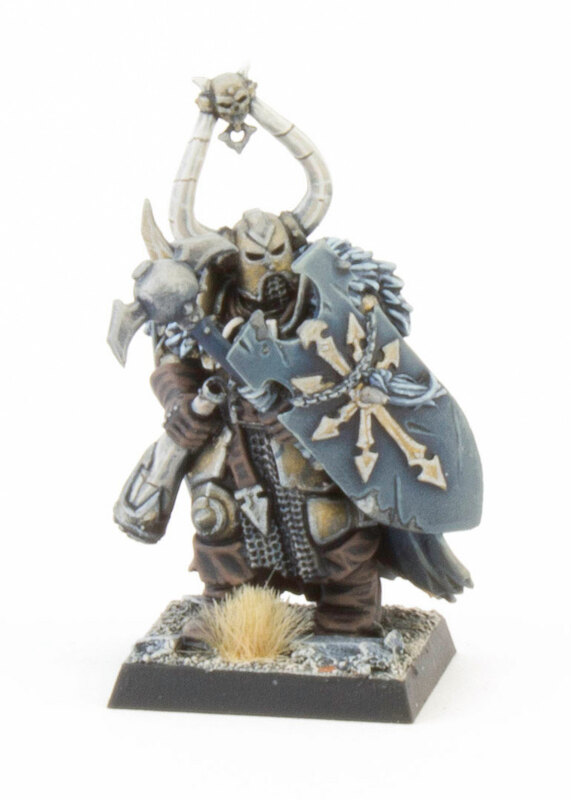 Then apply all the base colours for each element on the model (Vallejo Bronze for the armour, Leadbelcher for the weapons, Dryad Bark for the leather and Rackarth Flesh for the bone). 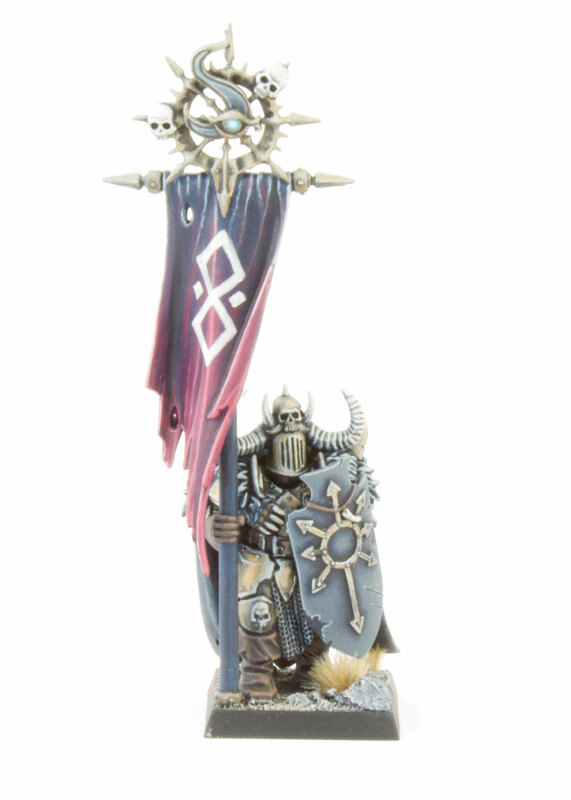 When the base coats are dry, wash the whole model with Drakkenhoff Nightshade – this gives it the blue tone. Then use the base coat colour to do the first set of highlights for each element (leave the blue shading in the recesses and details). 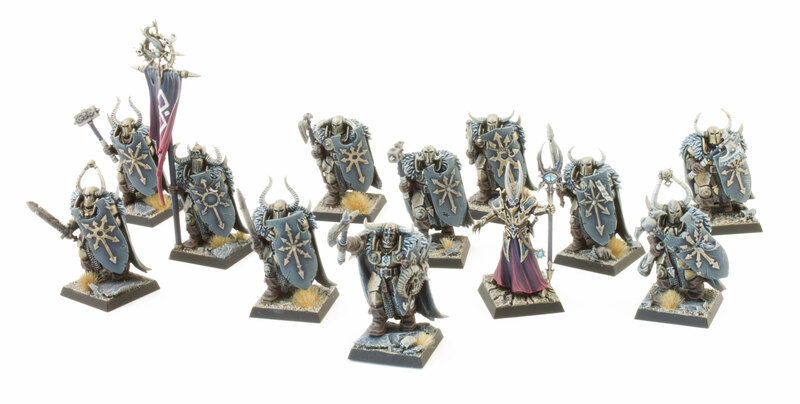 Then use Stormhost Silver to highlight a=the weapons and armour, Vallejo Field Blue for the cloaks, Gorthor Brown for the Leather andPallid Wych Flesh for the bone. 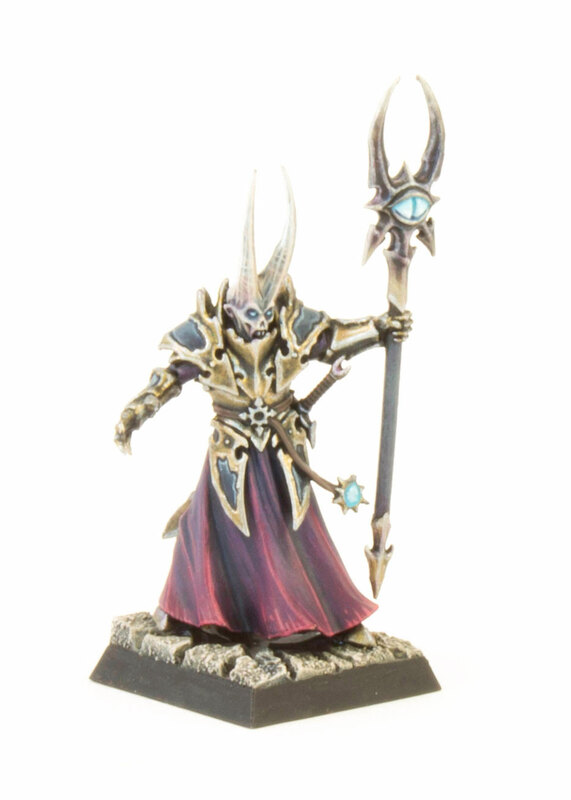 I also used Baharroth Blue/ Templeguard blue for the magical glow.